Neither manager Jim Harvey or chairman David Bosomworth would be drawn on the future of Town striker Shaun Tuton after he was left out of the matchday squad for Saturday’s 1-1 draw with Welling. The forward has previously been linked to a move to Championship clubs Birmingham and Cardiff, and had a spell on trial at Morecambe last year. 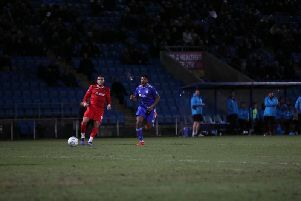 He has scored 12 goals in 32 appearances for The Shaymen this season after joining the club from Buxton at the start of the campaign. Harvey was tight-lipped about the reason for Tuton’s absence, but refused to comment on speculation about the striker’s future, as did Town chairman David Bosomworth. However, the Town boss did say he would be interested in extending the loan of Shaquille McDonald from Derby, and said forward Danny Hattersley could be set to leave the club either on loan or permanently having recently returned from a loan spell at Chester.